This had a good mombubot score and only missed out on keyword meta inclusion and density. This page for the most part looks to be in good SEO shape, but how come they are not in the top 10? Well in this case, let's take a look at the top 10 directly and see if we can come up with some answers. Interesting enough the thing which seems to be beating this site is that the other sites are closer to the search term buy using "Entrepreneur and Entrepreneurs" as the primary target rather than "Entrepreneurship". When searching for "Entrepreneurship" this page is in position 2 right under wikipedia. So considering "Entrepreneurship" is the primary this page places quite well for a secondary term "Entrepreneur". 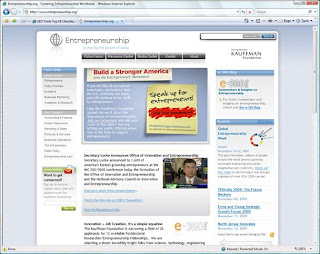 In the 10 position just above this page is http://www.kauffman.org/ which is the foundation main site which supports the page we are looking at. The Kauffman site does use the keyword meta tag which is one simple thing the page we are investigating should do. Follow the standards as much as possible and included all the SEO best practices. Mombubot.com can help you check your score.